Beginning of this year I have scheduled only 1 Marathon and was planning to do the Singapore International Marathon. However, I opted to do the QCIM2 as I wanted to redeem myself from last year's QCIM. 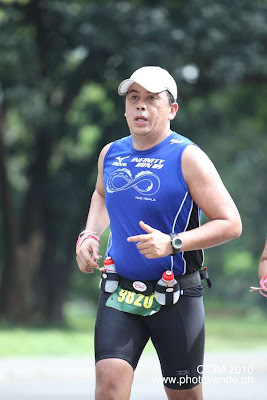 I ran the half marathon (21km) then and was actually nursing an ITBS injury at that time. I remember struggling from km 15 until the finish line as I spent most of the time walking. It was for me one of the worst race I have joined and I wanted to have a comeback and decided to do the full marathon in this event. But the pain of having a bad race didn't stop there. 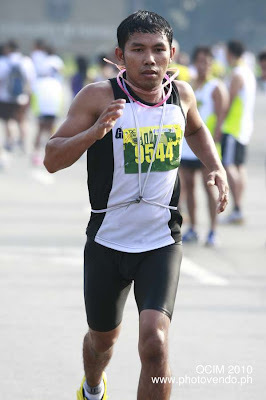 It was in November 2009 where I joined my first Marathon in Bangkok (Standard Chartered Bangkok Marathon) and true enough, this for me was a bad experience for my marathon debut. Due to the fact that I was nursing an injury last year, I was not able to train properly and had a lot of pressure nearing the event. There was no turning back since I was already committed to join the race. I went to therapy and did cross training using my bike in order to compensate for the running mileage that I lost. I did finished the Marathon in 5:42:07. 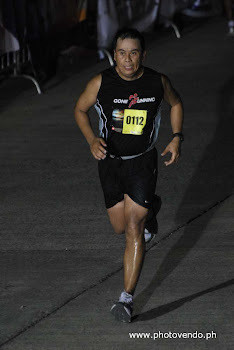 Luckily this year I was able to train and was glad to have been invited by the baldrunner to join the PAU 50k run (Tagaytay to Nasugbu) in November. I remember that my split time at 42km was 4:57. It elevated my confidence level going to this marathon. 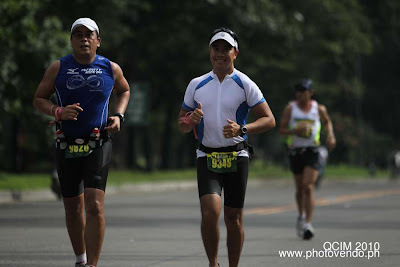 There were 4 members of Gone Running Club that joined the marathon, Me, Jay, Jun, and Kuya Ernie (his first marathon). We arrived early in the area and had ample time to prepare before the race. I thought the gunstart was at 4:00am, and was actually surprised that the organizers were still setting up the clock, portalets, and genset arrived late. I had an initial expression that this race was not organized properly. But didnt dwell on it, as I dont really let negative vibes affect me so I patiently waited for gun start and just focus on my goal which was to at least have a sub-5hr marathon. Told Jay at gunstart I was eyeing for 4:45 (stretch goal). The race course for me was tough due to the rolling hills but it was a good route. Turnaround was at the La Mesa Eco park, the place was nice and well preserved. As we enter the La Mesa Eco park, we were advised to leave our hydration belts. Not sure what the logic was behind it though. Jay's experience last year was the lack of hyrdration and it was a good thing that it was addressed this year. Hydration was sufficient and I have no complaints. I was doing fine in the first 28km, but not too long did I hit the collapse point. I started doing more walk breaks and it was all mental for me all throughout as I was starting to cramp in the last 8km. On the way back to commonwealth, I recall that I was practically walking along that road last year, and made me push to avoid too much walk breaks. Eventually I reached the last km and I knew that my time was better than my first marathon and I was happy about it. I did finish in 5:05:15 it was a 37 min improvement from my last marathon. This is a new marathon PR for me and definitely I will be training more so that I can improve further in the next marathon race. Who knows, I might be able to pull another 30 min improvement next time. with Jay who paced with me all throughout and motivated me not to walk too much. Jun Moslares who finished in 3:31 (unofficial time). Mark, nice post and a great redemption marathon my friend! Thanks for the invite on Facebook. I'll try and get in contact with your friend who's in Fremont. We're a few mile apart but we'll try and get some training runs in. Please take care and Happy Holidays to you and to the Gone Running Club. Thanks for visiting Wayne and Happy Holidays from all of us in GRC! 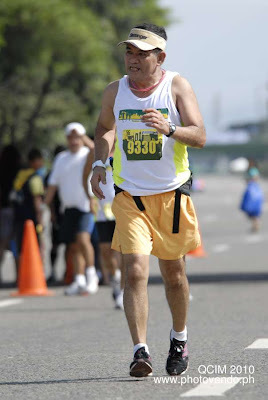 just passing through po.. nice blog po.. congrats and keep on running!